Beer is made to be enjoyed from a glass. The foam, aroma and experience is enhanced by the glass shape. Many beer enthusiasts claim that beer tastes better when it’s pulled from a keg or beer tap. Not all of us have the room in our house or budget for the full beer tap installation. Which is why Fizzics created their Waytap portable beer dispenser units. 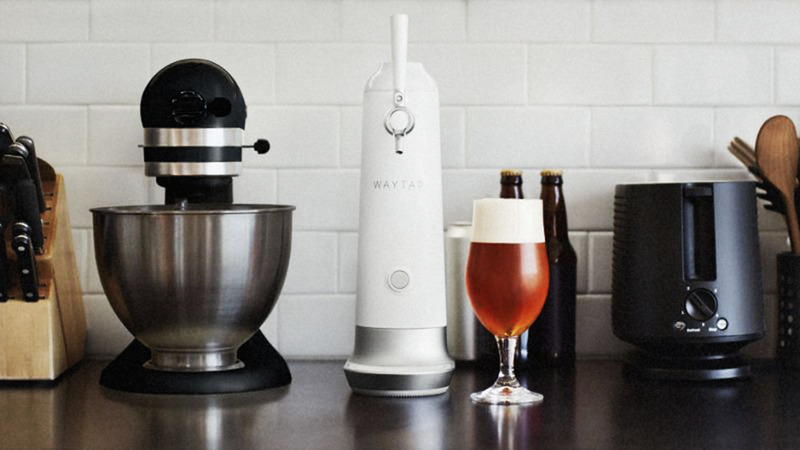 The Fizzcis Waytap, released this past spring, is a portable beer dispenser that’s small enough to fit in even my small apartment kitchen. It sleek design is quite attractive, reminiscent of something out of a sci-fi bar. BPA free and battery operated, the Waytap is compatible with 12 to 25 oz (355ml to 740ml) cans and 12 oz (355ml) bottles. It is a pretty simple concept. You place the can or bottle inside the machine and insert the “straw” into it. Then you close the whole unit and pull the lever. Beer pours into your glass just like it would from a beer tap (remember to tilt the glass if you don’t want a ton of foam). Changing the can/bottle is easy – remove the body, replace the can/bottle in the base, repeat the set up process and go. If you’re changing beers, I would suggest cleaning the unit before putting in the new beer, to ensure that there isn’t any remaining beer in the unit. They provide cleaning instructions in the box, though I had to read them over a few times before I figured it out. The base must be attached to the body in order for the machine to work. I’m not sure if there was any really change when I tested it. That being said, the machine did keep the beer pouring fresh over an extended duration, which makes it worth having around if you like sipping beer slowly over time. It’d also be great at parties. You can get the Fizzics Waytap in white, black or slate grey.